Located within 10 minutes drive from the airport, this boutique resort will take you to a different world altogether. If you are planning a romantic vacation, in your honeymoon, or just longing for a quiet solitude as you relax in a rustic atmosphere surrounded by greenery & plantations, read books and eat good food, then this resort is for you. Although this is a small resort, it offers delicate luxury, lots of attention to details, personalized services and modern amenities like pool (in lush garden setting), TV with DVD, in room A/C, and other facilities. There are 8 villas in Bon Ton each with a name. 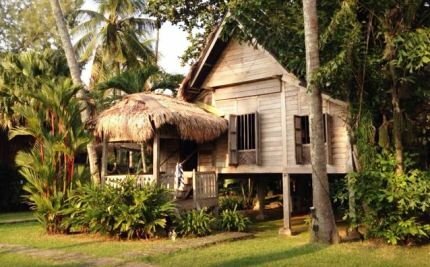 Actually these are old and original Malay houses that were once built in traditional Malay architecture and moved to this resort. All of them stand on stilts and some of them are over 120 years old. So the theme here is to give you an authentic flavor of living in the older times in the island but mixed with luxury and modern day amenities. The houses look worn out from outside, actually they are not. They have been kept that way so that they look like the original houses they once were. Once inside, you will immediately feel the difference. Some of the villas are much larger than the others and have extra large bedroom, some even with a front balcony which is ideal to relax, watch sunset and have a sundowner. Inside the villas you should look at the carvings below the windows, the furnishing that match with the theme, and of course the space. An external wooden stairway lead up to the entrance of the villa. The bathrooms are also huge and have Chinese style wooden bathtub. The larger villas have double sinks and some even have open air shower with bathtub. Villas have queen or king size beds with feather pillows. Like Palm villa, Laguna villa too is large and has a private balcony. However Laguna has a lovely view of a lagoon. All rooms come with color TV with DVD (so that you can watch movies), a fridge, toaster, tea/coffee maker, a/c etc. Complimentary continental breakfast is kept in the fridge on the previous night so that you can take your breakfast next morning at leisure. Breakfast is simple and includes bread, jam, butter, fruits & juice, homemade cake, yogurt etc. Wi-fi internet access is available but works mostly in the reception and cafe/bar area. You can also get connections in the rooms but may not always work consistently. There is a long narrow pool surrounded by coconut and palm trees, and lush greenery. Lounge chairs and umbrellas are provided by the poolside. This is a great place to read books as you hear chirping of the birds and smell the fresh air all around. Nearby is a gazebo which is great for watching sunset. There is also a wooden Sundeck which is ideal to take cocktails and watching the sunset. It serves Tapas/Mezze items and nice cocktails. The house bar too fits in perfectly with the overall ambience. The Asian style bar serves good cocktails, wine and liqueur. The happy hour from 5pm-7pm and complimentary cocktails are offered to the guests. One of the best aspects of the resort is its in-house Nam Restaurant which is arguably the best fine dining restaurant in Langkawi. It serves western and eastern fusion cuisine and you can not fault any dishes. The restaurant serves both lunch and dinner (but no breakfast). Outside guests are also welcome.Waiters and waitresses in traditional Malay attire serve you the food. The service is prompt and the food is simply delicious. The restaurant has alfresco dining in a garden setting with lots of plantations around and views of vast paddy fields. The owner seems to be in love with cats. There are lots of them around. In fact don't be surprised if one of them enter your villa or sleep the whole night at your private veranda. The resort is linked to a nearby animal husbandry. The reception staff can arrange for car rentals or taxis to get around the island. Wonderful tranquil and quiet environment surrounded by plantations. Large lawns and lots of greenery. Although you are close to the airport and can see planes flying over you, you will still feel you are in a different world. A great place for honeymooners or couples on romantic vacation. Food at the restaurant is superb - both in quality and portions. The staffs at the resort are very friendly and cooperative. Since there are only eight villas, they would know the guests individually and can therefore take care of the guests more delicately. Location is very convenient and close to the airport (about 10 minute drive). The property is very well maintained and clean. If you do not like cats, then that could be a problem here... they are there almost everywhere. In fact if you keep the doors of your villa open, they will enter the room. They also urinate at will. There is no beach here. However Pantai Cenang beach is 2 minutes by taxi, you can also walk (about 10 minutes). Sometimes the air-conditioning may not be adequate in the large villas, particularly in hot afternoons. Installation of more wi-fi routers would help getting better internet connectivity at the rooms.